On Wednesday, the spectacular Swarovski star, designed by architect Daniel Libeskind, topped the Rockefeller Christmas Tree. With over three million Swarovski crystals, the star is over nine feet in diameter and weighs 900 pounds – it is a true artistic and engineering masterpiece. Stunning lighting can add drama to any space, not just Rockefeller Center. The illumination lights provide and their architecture can be pure art. 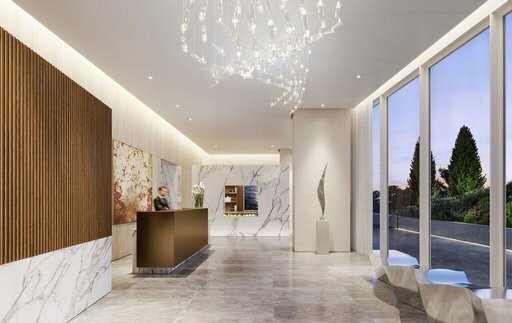 Many luxury residential buildings are using dramatic light fixtures as sculptural centerpieces and/or to highlight aspects of their buildings. Below, we have put together a list of 11 incredible lights to illuminate your imagination. 88&90 Lexington beautiful highlights old and new by seamlessly blending a classic pre-war building with a contemporary post-war building in the heart of NoMad. 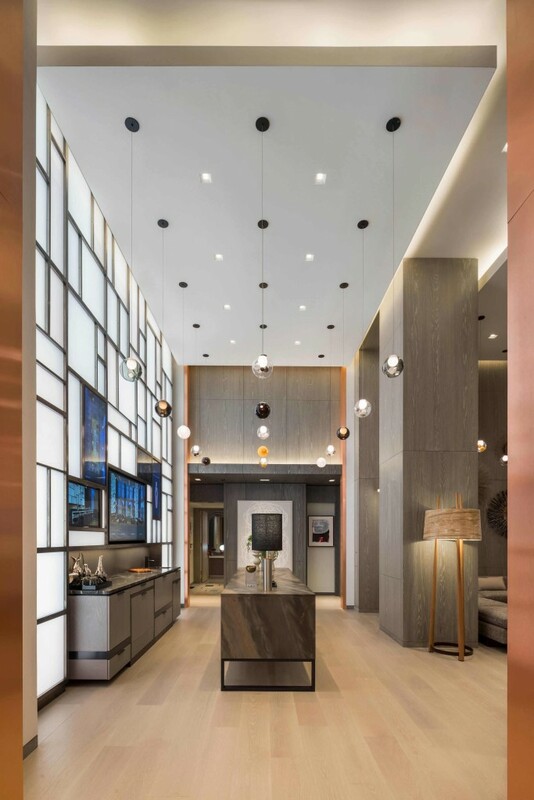 The buildings are united at their base by a bright, expansive lobby that features a multi-light pendant fixture that hangs above the desk and illuminates the building’s entrance. A neon “88” and “90” mark the entrance to each building, emphasizing the location of their separate elevator banks. 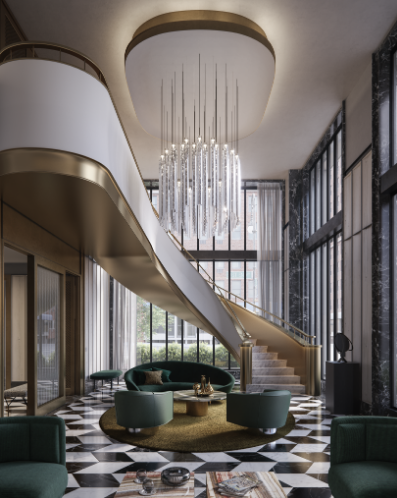 At The Kent, an art deco-inspired luxury condominium on the Upper East Side, Champalimaud Design commissioned a $33,000 pair of gilded chandeliers from Czech glass manufacturer, Preciosa. Designed to emphasize the Drawing Room’s cove, gold leaf ceiling, the sculptural work of art is composed of a series of luminescent glass orbs that refract light from within and reflect light from above. 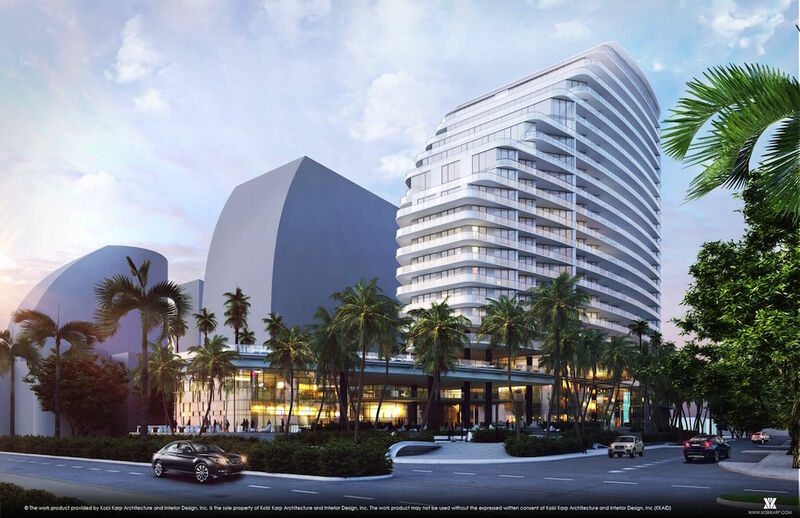 The project is an architectural collaboration between world-renowned and award-winning architects Deborah Berke Partners and GKV (Gerner Kronick + Valcarcel,) Architects. The chandelier’s design was custom by Deborah Berke in consultation with lighting consultant Bliss Fasman. 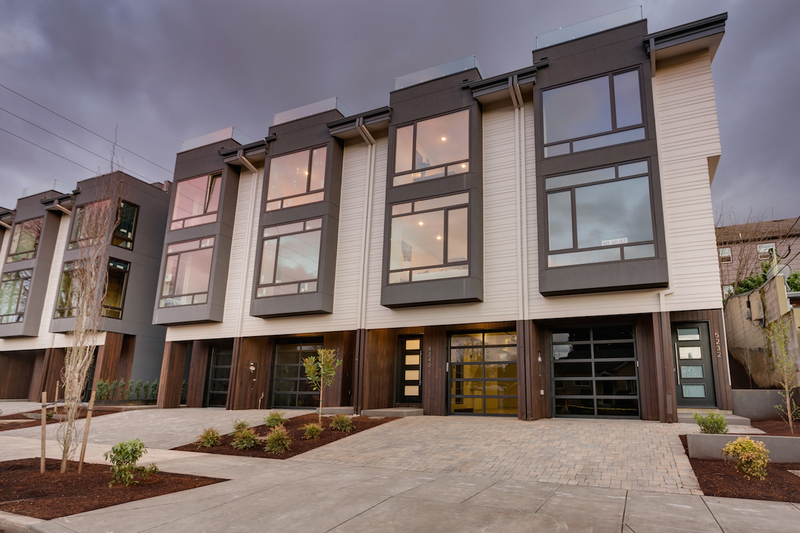 The design of 40 East End is a modern interpretation of local historic architecture, resulting in a dignified structure that grows from an articulated base and steps back neatly as it rises. 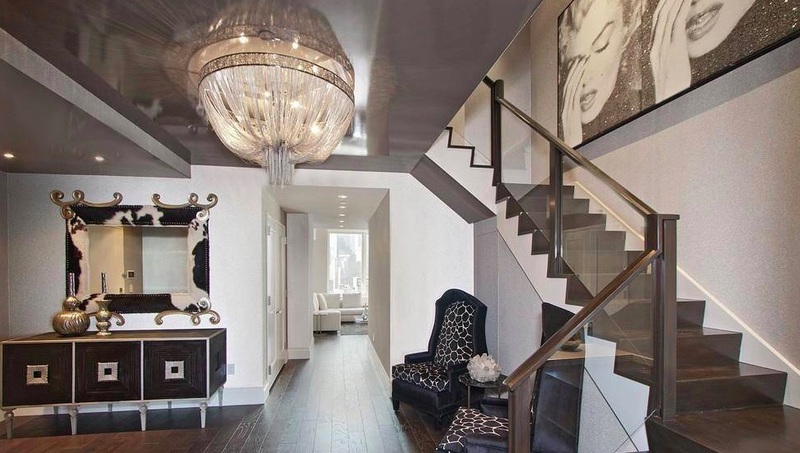 Similarly, the design of the chandelier harkens to a bygone era of opulence and glamour with a modern edge. The chandelier is custom and composed of 82 glass rods. Each glass rod is 3’-6” long by 3” diameter by 3/16” thick. It is fully frosted in the middle from sandblasting and gradually fades to clear on the top and bottom. These are suspended by a LED pin light which illuminates the glass tube in the center and also gradually fades away on the top and bottom. Standing at 777 feet tall, Madison Square Park Tower is the tallest residential building between Midtown and Lower Manhattan. 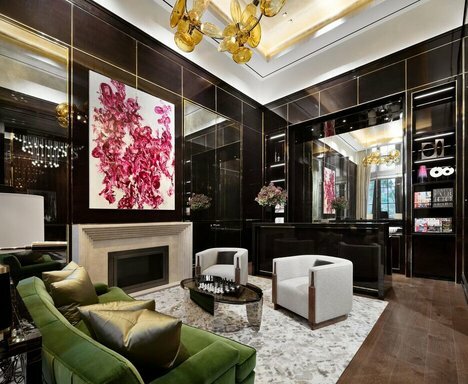 The building’s interiors and five full floors of lavish amenities were designed by the preeminent London-based hospitality designer, Martin Brudnizki. Inside the lobby, an enormous glass bowl chandelier with bronze detailing hangs above the lobby desk, which was custom designed by Martin and created by luxury Czech lighting company Preciosa Lighting. 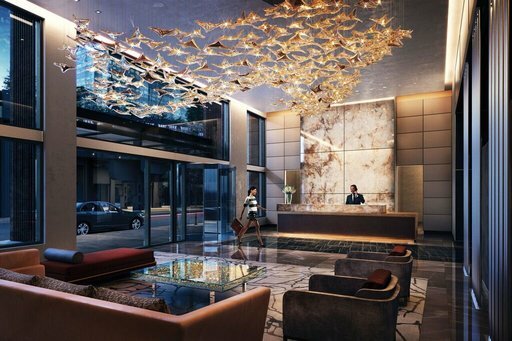 At 100 East 53rd Street, art collector Aby Rosen’s new modernist midtown tower, designer William T. Georgis commissioned Seguso from Venice Italy (a company that’s been around since the 1300s) to create a dramatic crystal Murano chandelier with beautiful, coral-like tubes. It is the focal point of the private residents’ club. Designed by Richard Meier & Partners Architects and appointed by Champalimaud Design, the gracious lobby of One Waterline Square is a glass-walled, light-filled entrance overlooking the five-acre Waterline Square site. 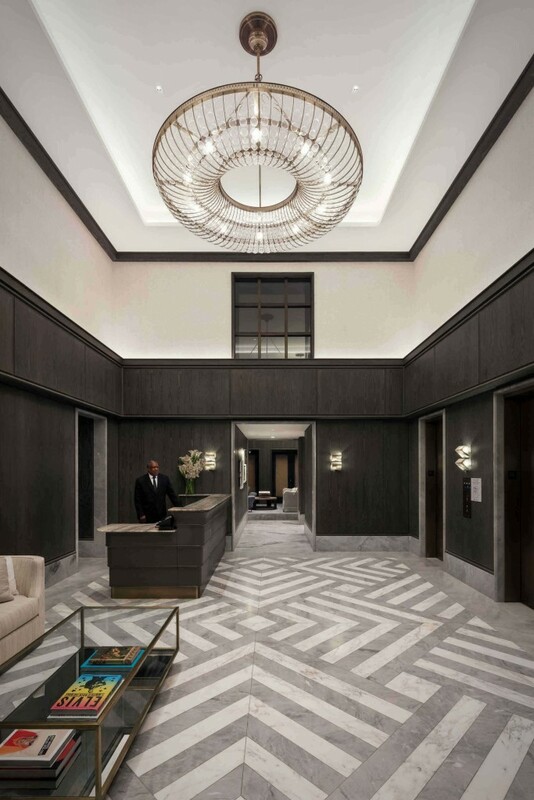 The stately space, located just inside a graceful porte-cochere, creates a sophisticated entrance and sense of arrival for the building’s residents. 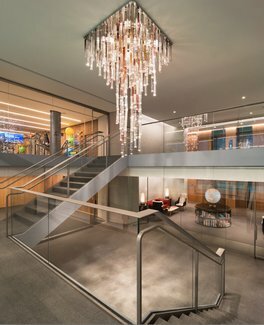 Designed by an Amsterdam-based art collective, the lobby’s bespoke ceiling light installation known as “Flylight” is made of delicate glass tubes and fashioned to interact with its surroundings, reflecting light from the marble and metal details inside the lobby and the Hudson River beyond it. 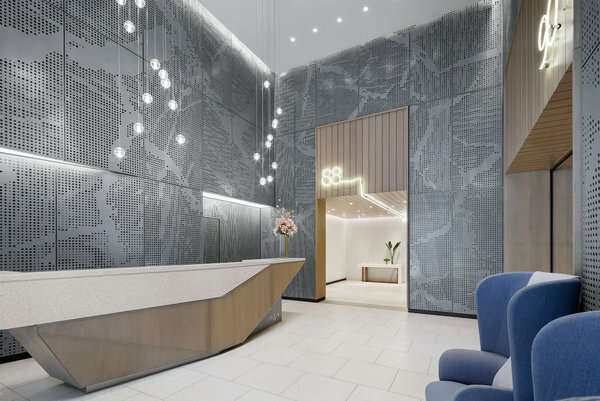 One Hudson Yards is Related Rentals’ newest rental building featuring 178 high-design luxury residences with a curated collection of art, wellness and lifestyle amenities and services. The 33-story building features bold architecture by Davis Brody Bond with layouts by Executive Architect Ismael Leyva Architects and rich interiors by the award-winning Andre Kikoski Architect. The lobby features a Francois sculpture called “Squiggle,” which is a line drawing in three dimensions, a gold leaf table dubbed Table d’oree, designed 1961 by Yves Klein using 3,000 sheets of gold leaf, glass, acrylic, wood and steel, and a custom light sculpture by Lasvit. At 70 Vestry, Related Companies’ boutique waterfront condominium by Robert A.M. Stern Architects, Related commissioned internationally acclaimed artist Alyson Shotz to create an original sculpture that interacts with the motion of the sun throughout the day and year. 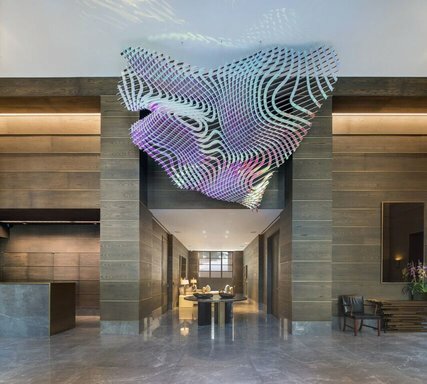 The iridescent large-scale sculpture, titled “Aileron,” has a shape and structure reminiscent of a butterfly wing and the variegated luminescent color results from a nanoscale configuration. Aileron is thoughtfully paired with white oak paneling, Fior di Bosco marble, and handcrafted furniture personally selected by AD100 designer Daniel Romualdez for the lobby as a way to play off the natural light of the gorgeous space that will soon welcome residents such as Tom Brady and Gisele Bünchen. 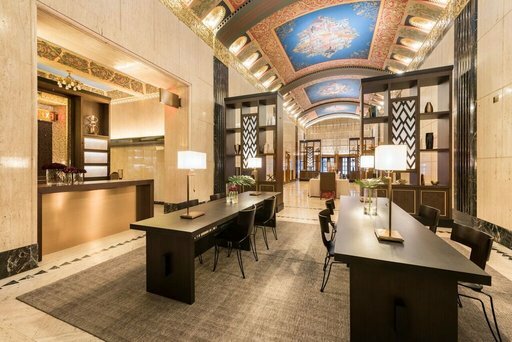 The central pendant light fixtures were designed by the architect of the building, winner of the American Institute of Architect’s “Architect of the Century” award and father of American Art Deco, Ralph Walker. The design is based on many of the geometries and motifs found throughout the building, notably the setbacks of the upper stories and the articulation of grapevines as a symbol of the interconnectivity of the human experience upon the advent of the telephone. The lights serve as a focal point in a space originally crafted with little natural light. DXA studio and PHT Lighting added additional, discreet fixtures atop the pendant to accentuate the gilded murals by Edgar Williams depicting the history of human communication above. Additionally warmer temperature high efficiency bulbs were added to the gilded niches along the ceiling and linear, uplighting fixtures were added beneath the bronze screens at the entry to unify all of the lighting in the lobby as a single composition, with the pendants as their center. 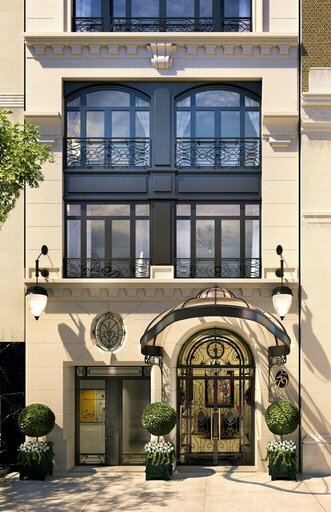 Located in the heart of the Upper East Side, this new condominium has stunning lanterns on the front facade of the ground floor known as “T-shaped lanterns“ in the late 19th-century taste. The decorative esthetic choice for this project is based on the French late 19th century, particularly Parisian. It brings together complex decorative components marrying a plethora of materials, it is the industrial era with iron in the construction, which produced, following the Eiffel Tower, buildings in Paris known as “eclectic” which housed among others, famous newspapers from the time period such as L’Aurore. These lanterns are made with iron elements, put together, then patinated in harmony with the ironwork of the façade. For the glass globes, a wooden mold will be made to be able to pour and to shape the molten glass in a way to make its definitive form. 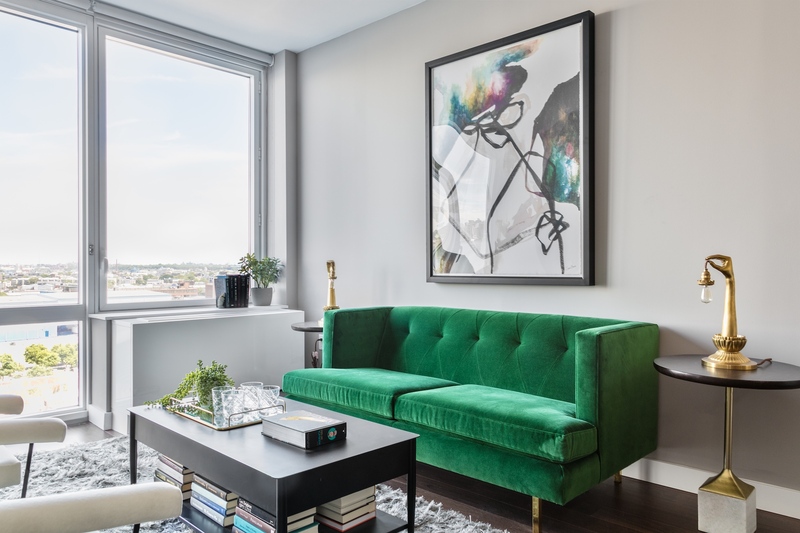 AD 100 designer Katherine Newman’s first project in Brooklyn is a major step for the residential interiors expert, who typically only takes on five select private home projects a year primarily in New York’s exclusive upper East Side. Extell tapped Katherine to design the interiors and 40,000 square feet of amenities spaces of this towering residential structure located in the rapidly transforming Downtown Brooklyn neighborhood. 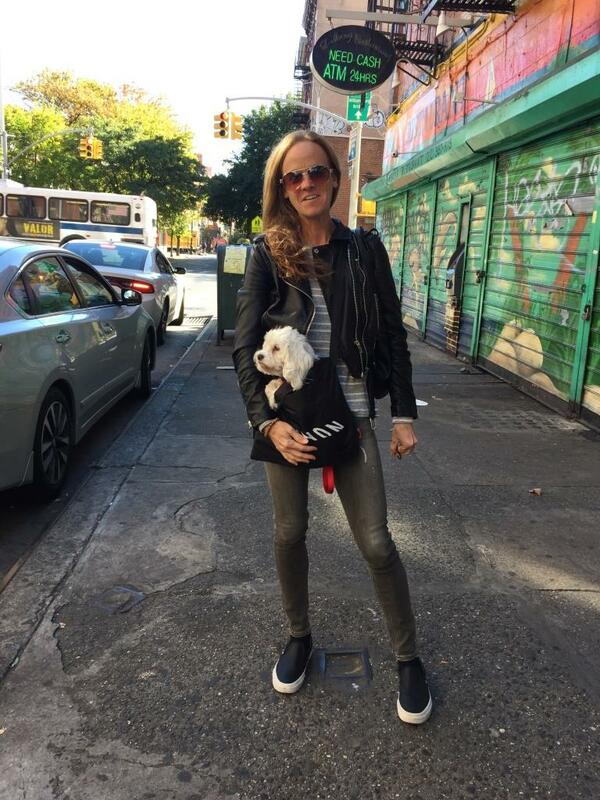 Katherine’s team has paid homage to Brooklyn’s history with an industrial-informed aesthetic that simultaneously brings a sense of elevated Manhattan style to Downtown Brooklyn. A stunning collection of globe lights will hang in the double height lounge, illuminating the welcoming interiors. They lights now hang in the sales gallery, and will be transported into the building upon completion.